As the millions who have done it know, going back to school is a major undertaking. For younger and older adults alike, returning to school presents different challenges than those encountered by teens fresh out of high school and heading straight to college. Countless adults take on this task while working, raising kids, caring for parents, volunteering, serving in the military--and in some cases all of the above. Although the "non-traditional" undergraduate student is now the new normal, the glut of college guides out there doesn't include practical advice for the busy moms, frustrated employees, and ambitious individuals who want to earn a degree. Never Too Late will help readers jump-start a new professional path or speed down the one they're already on by guiding them through vital questions: What should I study? How can I afford the time and money required to get a college degree? How do I compare schools? With key chapters on flexibility ("It's About Time " and "Face-to-Face or Cyberspace?") 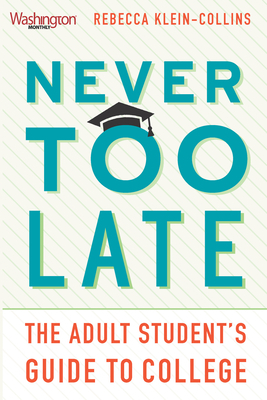 and rankings of the best colleges for grown-ups diving back into the books, Never Too Late is an essential reference for adults seeking a richer life--and for our rapidly changing economy and world. Rebecca Klein-Collins is the associate vice president of research at the Council for Adult and Experiential Learning, a group that aims to enhance learning opportunities for adults around the world. She holds degrees from the University of Chicago, Indiana University, and Grinnell College and lives in Naperville, Illinois.